Which loan is right for you, secured or unsecured? There are many people everyday who consider applying for a loan to cover the cost of a project they have in mind. Anyone who doesn’t want to take the time to save up to pay for that cost, or they need a really large loan, will begin to find out about loans and which one they should apply for. Their first discovery will be that there are two types of loans available, the secured and the unsecured loan. With some reading they will find the secured loan is connected to collateral such as your home for instance. This loan will cost less because the lender has that asset to use to gain back their money if you were to default on the loan. The unsecured loan has no collateral and so this loan will carry a high interest rate and this loan is harder to be approved for. Lenders see this loan as a high risk to them since there is no way to force the borrower to comply with the terms of the loan. These loans are generally small and short term for things such as medical costs, weddings and also funeral expenses. Banks will typically not extend an unsecured loan to just any applicant. This person must have a stable income as well as a history of payments made on-time to be considered. 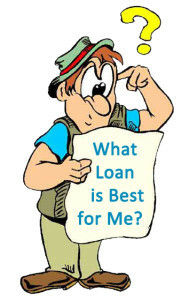 If neither of these loans sound like what you are looking for, then perhaps it is a payday loan that is right for you. This loan does not come from a bank but from online lenders who are not concerned with and won’t even check your credit score. You can find out how it works here so you understand how this loan differs from other loans. Not everyone is looking for a large loan that will take a year or so to pay back. Some people just need a small loan because they are broke between paydays and this is why payday loans were created. Knowing the secured or unsecured loan for the project you have in mind will allows you to connect with the right lender. My debt problems – How did I handle them? Why not try living on less money?